The popular Florentine subject of the young John the Baptist is here presented in a different conception from that of Antonio Rossellino's delicately beautiful marble bust. The difference is not only in the medium, painted terra cotta, which has retained much original coloring that contributes to an immediate naturalism. The sculptor of this bust also has given it a particular psychological intensity. The face is thinner; the features relatively individualized; and the gaze distant in a way that from some angles suggests inward concentration on his message, from others suggests focus on some faraway listener. The long, richly modeled and differentiated hair is at once elegant in its swirling waves and unruly in its loose wisps, suggesting passionate energy that is reiterated by the cloak sweeping across the chest to twist into a knot at one side. The open mouth implies the saint is already preaching. Possibly purchased 1846 in Italy by Eugène Piot [1812-1890], Paris. Louis-Charles Timbal [1821-1880], Paris, by 1868; purchased 1872 with the entire Timbal collection by Gustave Dreyfus [1837-1914], Paris; his estate; purchased 1930 with the entire Dreyfus collection by (Duveen Brothers, Inc., London, New York, and Paris); purchased 15 December 1936 by The A.W. Mellon Educational and Charitable Trust, Pittsburgh; gift 1937 to NGA. This information is given in the Duveen Brothers prospectus, in NGA curatorial files. 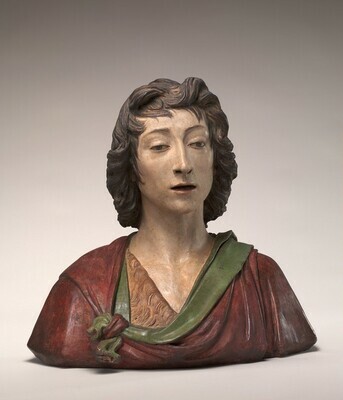 A half-length terracotta bust of Saint John the Baptist with traces of color, the same height as the NGA sculpture, is listed as no. 83 in the Piot sale of 25-30 April 1864 at Hôtel Drouot. However, the description also says "the right arm and hand are placed against the chest," which does not match NGA 1937.1.130. Charles Perkins, "Donatello," Gazette des Beaux-Arts 25 (October 1868): 312. The sculpture was lent by Dreyfus two years later to an 1874 exhibition in Paris. The original Duveen Brothers invoice is in Gallery Archives, copy in NGA curatorial files; the sculpture is listed as by Donatello. Objets d'Art, Exposés au profit de la Colonisation de l'Algèrie par les Alsaciens-Lorrains, Palais de la Prèsidence du Corps lègislatif, Paris, 1874, no. 34 of Salon 13. Sculpture and Medals of the Renaissance from the Dreyfus Collection, Fogg Art Museum, Cambridge, Massachusetts, 1932, as by Donatello. Perkins, Charles. "Donatello." Gazette des Beaux-Arts 25 (October 1868): 312 n. 1. Vitry, Paul. "La collection de M. Gustave Dreyfus: I. - La Sculpture." Les Arts 72 (December 1907): repro. 5, 9-10. Bode, Wilhelm von. Florentiner Bildhauer der Renaissance. 4th ed. Berlin, 1921: 219. Bode, Wilhelm von. Florentine Sculptors of the Renaissance. Translated by Jessie Haynes. Rev. 2nd ed. London, 1928: 157. (Reprint, New York, 1969). Rutter, Frank. "Notes from Abroad. The Dreyfus Collection - Other Notes." International Studio 97 (September 1930): 60-64, esp 60. Rowlandson, Benjamin, Jr. "The Dreyfus Collection. A Review of the Exhibition." Bulletin of the Fogg Art Museum 1 (March 1932): 54-56, repro. Cortissoz, Royal. An Introduction to the Mellon Collection. Boston, 1937: repro. opposite p. 19, as by Donatello. Jewell, Edward Alden. "Mellon's Gift." Magazine of Art 30, no. 2 (February 1937): 73-83, esp. 83, repro. Wittkower, Rudolf. "Sculpture in the Mellon Collection." Apollo 26, no. 152 (August 1937): 79-84, esp. 80 fig. II, 82. Frankfurter, Alfred M. “Great Sculpture of the Italian Renaissance in the National Gallery.” Art News 40, no. 9 (1-31 July 1941): 12, 28. Frankfurter, Alfred M. "On the Italian Renaissance Painters in the National Gallery." Art News 40 (15-31 March 1941): 13, repro. Preliminary Catalogue of Paintings and Sculpture. National Gallery of Art, Washington, 1941: 223, no. 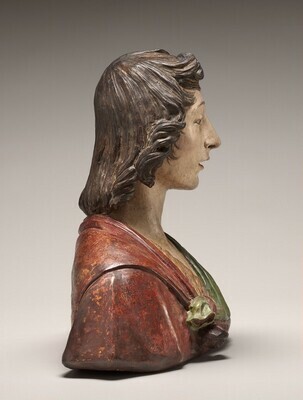 A-19, as Bust of Saint John the Baptist by Donatello. Book of Illustrations. National Gallery of Art, Washington, 1942: 253, repro. 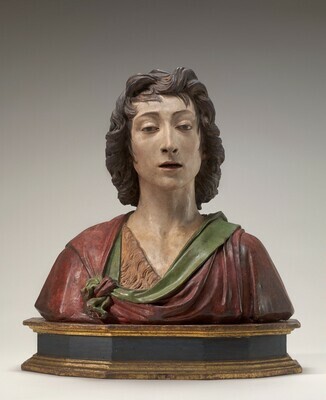 227, as Bust of St. John the Baptist by Donatello. Duveen Brothers, Inc. Duveen Sculpture in Public Collections of America: A Catalog Raisonné with illustrations of Italian Renaissance Sculptures by the Great Masters which have passed through the House of Duveen. New York, 1944: figs. 15-16, as by Donatello. Paintings and Sculpture from the Mellon Collection. National Gallery of Art, Washington, 1949 (reprinted 1953 and 1958): 149, repro., as by Donatello. Seymour, Charles. Masterpieces of Sculpture from the National Gallery of Art. Washington and New York, 1949: 175 n. 18, 72-73, as by Donatallo. Ida Cardellini, Ida. Desiderio da Settignano. Milan, 1962: 88 n. 17. Summary Catalogue of European Paintings and Sculpture. 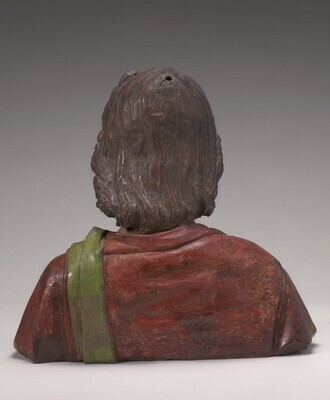 National Gallery of Art, Washington, 1965: 153, as by Donatello. European Paintings and Sculpture, Illustrations. National Gallery of Art, Washington, 1968: 136, repro. , as by Donatello. Finley, David Edward. A Standard of Excellence: Andrew W. Mellon Founds the National Gallery of Art at Washington. Washington, 1973: 42. Walker, John. National Gallery of Art, Washington. Rev. ed. New York, 1984: 631, no. 981, repro., as Studio of Benedetto da Maiano. Luchs, Alison. "Duveen, the Dreyfus Collection, and the Treatment of Italian Renaissance Sculpture: Examples from the National Gallery of Art." Studies in the History of Art 24 (1990): 34-35, repro. National Gallery of Art. National Gallery of Art, Washington. New York, 1992: 290, repro. Sculpture: An Illustrated Catalogue. National Gallery of Art, Washington, 1994: 28, repro. Pisani, Linda. "San Giovannino Battista nei busti del Rinascimento Florentino." In Jeanette Kohl and Rebecca Müller, eds. Kopf/Bild: Die Büste in Mittelalter und Frïher Neuzeit. (I Mandorli 6) Munich and Berlin, 2007: 232, no. 27. Chloros, Jessica, Holly Salmon and Craig Uram. “Italian Renaissance Polychrome Terracotta Sculpture in the Isabella Stewart Gardner Museum.” In Glass and Ceramics Conservation 2010. Interim Meeting of the ICOM-CC Working Group, October 3-6, 2010. Hannelore Roemich, editorial coordinator. Corning, New York, 2010: 210-217. Knuth, Michael. "Desiderio da Settignano und seinem Umkreis zugeschriebene Bildwerke in Berlin." In Alessandro Nova, Beatrice Paolozzi Strozzi, and Gerhard Wolf, eds. Desiderio da Settignano. Venice, 2011: 199, repro. 203, as Florentine, second half fifteenth century (?). Bellandi, Alfredo. Leonardo del Tasso, Scultore Fiorentino del Rinascimento. Paris, 2016: 66, 150 fig. 163, 254-256, repro. 255, as Attributed to Leonardo del Tasso and dated 1490/1500.